Tripp Lite's 3.05 m (10-ft.) bi-directional parallel printer cable connects computers with a DB25 female parallel port to parallel printers with a Centronics 36 female parallel port. The cable has DB25 male/Cent36 male connectors and supports bi-directional communication. It is manufactured from superior molded cable with integral strain relief and foil shielding for maximum EMI/RFI protection. Bi-directional communication allows your printer to broadcast printer error messages back to network computers. Use IEEE cable if IEEE specifications are required. 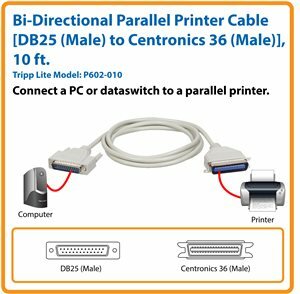 Tripp Lite’s P602-010 Bi-Directional Parallel Printer Cable connects computers with a DB25 female parallel port to parallel printers with a Centronics 36 female parallel port. Equipped with DB25 (male) to Centronics 36 (male) connectors, this 10 ft. cable supports bi-directional communication with a printer to broadcast error messages back to network computers. Unlike cut-price cables, the P602-010 is manufactured to exacting specifications, using superior materials. Its molded cable construction with foil-shielding reduces EMI/RFI interference for optimal performance. The P602-010 comes with a lifetime warranty. It’s manufactured in compliance with strict RoHS specifications, reflecting Tripp Lite’s commitment to environmental responsibility. P602-010 Bi-Directional Parallel Printer Cable [DB25 (Male) to Centronics 36 (Male)], 10 ft.